On the rocky outcrop, the Swallowtail Lighthouse on Grand Manan Island in New Brunswick, Canada watches over the waters to keep water vessels safe. 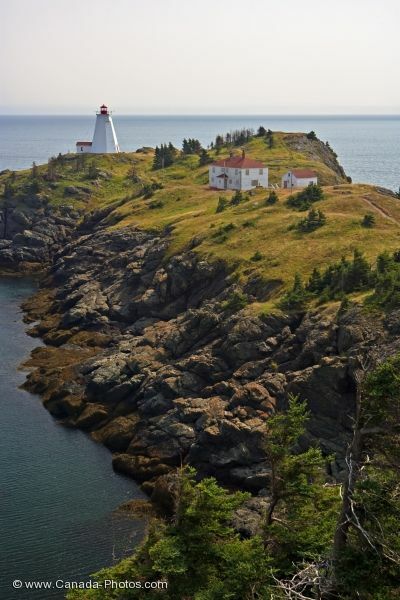 Every 6 seconds, the light from the Swallowtail Lighthouse on Grand Manan Island in New Brunswick, Canada flashes and can be seen for 12 nautical miles. Surrounded by the rocky coastline, the lighthouse has adorned this peninsula since 1860. The buildings once housed the two lighthouse keepers and their families, but has since been turned into a bed and breakfast. A beautiful place to rest for a day or two and enjoy the beauty of Grand Manan Island. Swallowtail Lighthouse, North Head, Grand Manan Island, Grand Manan, Bay of Fundy, The Fundy Isles, Fundy Coastal Drive, Route 776, New Brunswick, Canada. Picture of the Swallowtail Lighthouse and the buildings on Grand Manan Island, New Brunswick.